WASHINGTON — Alaska's senior senator, Lisa Murkowski, as she is wont to do, brought her maps with her to a meeting in the Oval Office on Wednesday. Sen. Dan Sullivan brought the numbers. 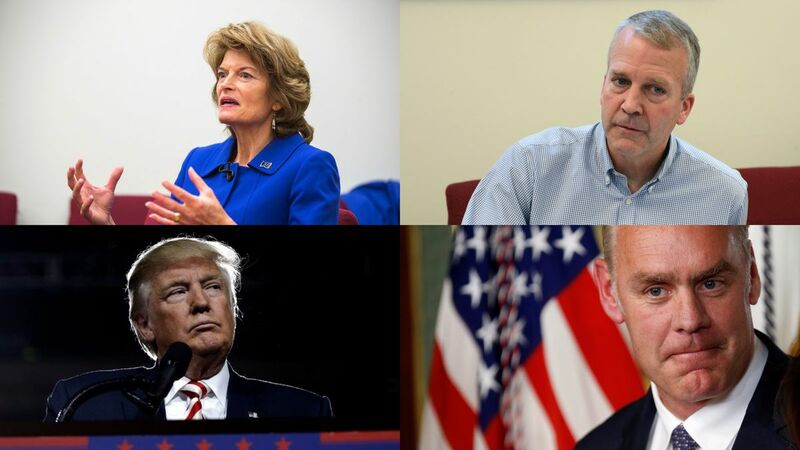 Together, they aimed to show President Donald Trump and Interior Secretary Ryan Zinke what the new administration can do for Alaska as the state battles budget struggles and an unemployment rate among the highest in the nation. The issues they laid out for the president could very well act as a roadmap for the administration's future actions in Alaska. Murkowski brought a map that showed Alaska overlaying the Lower 48, demonstrating the state's formidable size. Another showed Alaska's limited road system. Another detailed oil and gas production on the North Slope. And she brought a map that showed the area and diversity of federal land management operators across the state. "I think he's just a very visual person," Murkowski said of Trump. "And it really allowed … for a wide-ranging conversation." Murkowski likes showing Alaska maps to visitors to her office, and Sullivan appears to relish discussing the details of economic data. He told Trump about how many billion cubic feet of gas comes out of Prudhoe Bay, and how that compares to Canada's usage. Murkowski, Sullivan and Zinke met with the president at the White House on Wednesday afternoon for nearly an hour. The meeting Wednesday was Sullivan's second trip to the White House in as many weeks. He attended the signing of an executive order requiring a redo of an Obama administration Environmental Protection Agency water regulation. Murkowski chairs the Energy and Natural Resources Committee, which was responsible for ferrying Zinke's nomination through Senate confirmation. She also heads the Appropriations Subcommittee responsible for the Interior Department budget. Murkowski said the visit was initiated by the White House — her staff got a call on Friday while she was on a flight north, headed home for the weekend's Iditarod festivities. At the outset of the meeting, Trump talked about his grandfather's time in Alaska, Sullivan said. Frederick Trump reportedly spent time in the Yukon around 1900, though Trump hasn't raised the issue in public recently. The president "had a lot of pride in that," Sullivan said. Trump said that his grandfather had a small hotel in the state, Sullivan said. And "when you have that kind of very real connection — I think it makes people excited," he said. "He seemed very enthusiastic about the connection with his grandfather — you could see that was very sincere." "I think he was very enthusiastic about what Alaska does have to offer," Murkowski said. "He was very curious and trying to understand the opportunities that we have for filling up our trans-Alaska oil pipeline," she said. They discussed the low flow in the pipeline, and what they could do to fill it up, Murkowski said. "And he was eager to understand more about what it is that he can do, what it is that the secretary of Interior can do," she said. "He seemed very excited and motivated to help us just by unleashing our resources," Sullivan said. "One of the things that we were kind of looking at was resource development opportunities that had been, step by step, locked up in the state," Sullivan said. That included discussion on the National Petroleum Reserve of Alaska and the Chukchi and Beaufort seas, he said. Murkowski didn't really elaborate on this part of the discussion, but Sullivan did mention discussion of building a road through the Izembek National Wildlife Refuge for residents of King Cove to access the airport in Cold Bay for emergencies. Sullivan said he pitched his legislation to divide up the U.S. Court of Appeals for the 9th Circuit. The group discussed "what we need to be doing to make sure we've got a strong military presence" in Alaska, Murkowski said. Sullivan gave his pitch to the president about the "strategic location" of Alaska for the U.S. military. He said he invited the president to come up to Alaska and "take the opportunity to review these troops as commander and chief." He noted that he had also extended that invitation to Obama. Using one of her maps, Murkowski showed Trump the close proximity of the Russian island of Big Diomede and the U.S. island of Little Diomede, in the middle of the Bering Strait. And she pointed out just where the water divides mainland Russia and Alaska by only 57 miles, Murkowski said. The Russia conversation also included the senators explaining their push for new icebreakers. They didn't get into the budget specifics for icebreakers, which cost about $1 billion each, Sullivan said, but they did discuss growing the U.S. fleet, "relative to what the Russians are doing with icebreakers." Russia has 41 icebreakers and nearly a dozen more in production. The U.S. has only one, 40-year-old heavy-duty icebreaker. The conversation wasn't short on discussion of how to overturn Obama-era regulations, according to both senators. They gave the president the full timeline of the Obama administration's Arctic actions, the senators said, with particular notice to his December closure of 125 million acres of Arctic offshore waters to drilling, and the November decision to cancel offshore oil leases. "While President Trump can't do anything by way of executive order, they can, the administration, can review that five-year plan and begin to take steps to amend that plan," Murkowski said. There isn't much that can be done by executive order, Murkowski said, but there is "a great deal that Secretary Zinke can do. That was why it was important that he be in the meeting as well," she said. Murkowski said she didn't know whether to eventually expect Arctic-focused announcements out of the White House, as happened during the Obama administration. But she did say she would like to see Arctic interests expanded beyond the climate change focus of the last president. The senators raised the possibilities for growing Arctic infrastructure, including building out telecommunications, adding a deep-water port and advancing icebreaker capacity, Murkowski said. Sullivan said the conversation was brief, but he let Trump know about the F-35 fighter jet squadrons headed to Alaska, and the F-22s that are already there. "He was very knowledgeable about the F-22s," Sullivan said. "We informed him (the F-35s) were coming and I think it was a useful discussion to let him know just how big a footprint Alaska has with our combat airpower in the United States," Sullivan said. "I've had a phone call with the president previous to today's discussion," Murkowski said. "And I told him in that phone call that while I had not supported him, I pledged publicly that whoever won I was going to be working with them," she said. On Wednesday, Trump "was very generous in his comments, and very kind, and we had a very good and very cordial, and most importantly, a very productive discussion," Murkowski said. "I think he's looking at this as a good, positive relationship," she said. "He was very positive, interested and very engaged," Sullivan said. "To me, that was the exciting thing."